A Special Central Bureau of Investigation court in New Delhi on Thursday acquitted former telecom minister A Raja, Dravida Munnetra Kazagham MP Kanimozhi and all other accused in the 2G scam case that had rocked the Manmohan Singh-led United Progressive Alliance-II government, holding that the prosecution 'miserably failed' to prove any of the corruption and money laundering charges. The stunning verdict came as an anti-climax in a case that had been repeatedly highlighted by the Bharatiya Janata Party during the 2014 general election campaign as the hallmark of corruption in the then UPA regime. The BJP turned the arbitrary award of radio frequency to telecom providers into a major political issue and put the UPA-II government on the mat. "I have absolutely no hesitation in holding that prosecution has miserably failed to prove any of the charges against any of the accused," Special CBI Judge O P Saini said in his verdicts in three separate cases related to the 2G scam in a packed courtroom at the Patiala House premises. “The judgment relating to the 2G scam case of today has been prima facie examined and it appears that the evidence adduced to substantiate the charges by the prosecution has not been appreciated in its proper perspective by the learned court. The CBI will be taking necessary legal remedies in the matter,” CBI spokesperson Abhishek Dayal said. The Enforcement Directorate has also decided to appeal against the judgment of the special court that acquitted 19 people in the 2G spectrum allocation money laundering case. Dealing a body blow to the Comptroller and Auditor General's and the CBI's estimation of huge loss in grant of 2G licences, judge Saini in his 1,552-page verdict in the main CBI case held that some people 'artfully' arranged few selected facts and created a scam 'when there was none'. In all, there were 17 accused, including Raja and Kanimozhi, both leaders of Congress ally DMK, in this case that also included three corporate entities. The three judgments, which together ran into 2,183 pages, included the one that stemmed out of the Enforcement Directorate (ED)'s money laundering case. The ED and the CBI said they will challenge before the Delhi high court the verdicts, which also unleashed a political slugfest between the BJP and the Opposition. There were 19 accused in the ED chargesheet some of whom figured in the CBI chargesheet filed in its main and offshoot case. 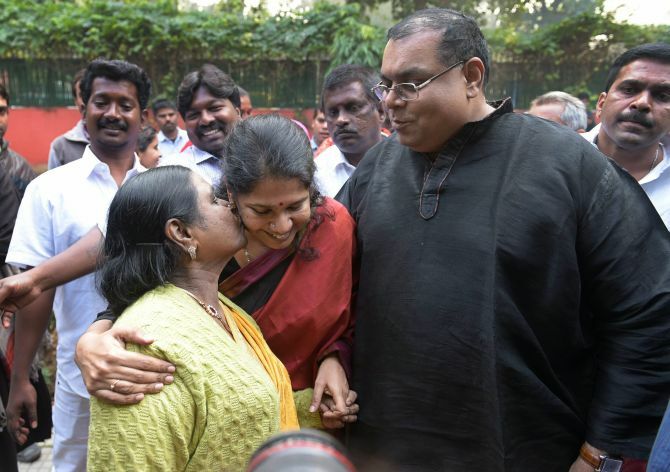 Buoyed by the verdicts, the Congress and the DMK said 'truth' has finally prevailed and that justice has been delivered while the ruling party asked the Congress not to treat them as a 'badge of honour'. The Congress demanded that Prime Minister Narendra Modi, Union Finance Minister Arun Jaitley and other BJP leaders apologise to the nation for their alleged 'propaganda and lies' on the issue. Manmohan Singh said the court judgment needs to be respected as it has 'pronounced that the massive propaganda' unleashed against his government was without any foundation. "Will all those people, including Prime Minister Narendra Modi, Arun Jaitley and other BJP leaders, who for years made false propaganda and lies their stepping stone to come to power, apologise to the country?" asked Congress communications incharge Randeep Surjewala. "Today is the day for fixing accountability and responsibility." In a counterattack, Jaitley said the Congress should not treat the 2G verdict as a 'badge of honour'. The party's 'zero loss theory' was proved wrong when the apex court squashed spectrum allocation in 2012, he added. "There is no evidence against me and justice has been delivered," Kanimozhi, daughter of DMK supremo M Karunanidhi, told reporters. A beaming Raja said, "You see everybody is happy." In a statement in the evening, Raja said the court acquittal showed that the presumptive loss in allocation of 2G spectrum was 'cooked-up'. He also debunked the presumptive loss theories in the allocation. Raja, who was the Telecom minister in the Congress-led UPA government when 122 spectrum licences were issued to eight companies in 2008 on first-come-first-serve basis, said his actions were for the benefit of masses. 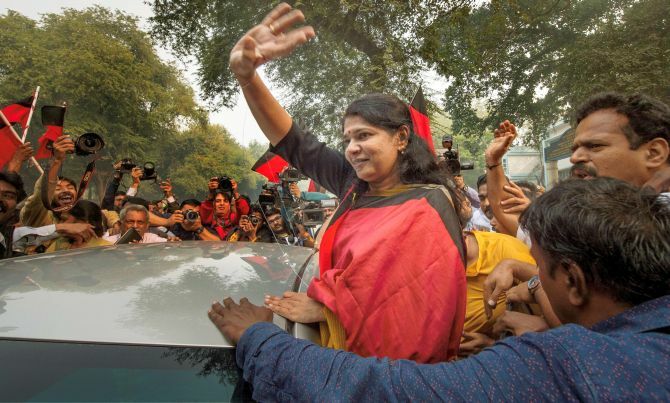 Raja remained in jail for over 15 months while Kanimozhi was in prison for six months before they were granted bail. Other accused persons were also in jail for varying terms. The trial in the three cases relating to the 2G scam began after the then CAG Vinod Rai in his report alleged 122 2G licences were given to telecom operators at throwaway prices when the UPA was in power and pegged at Rs 1.76 lakh crore the loss to the national exchequer. The CBI had alleged that there was a loss of Rs 30,984 crore to the exchequer in allocation of licences for the 2G spectrum which were scrapped by the Supreme Court court on February 2, 2012. Former telecom minister Kapil Sibal demanded an apology from Rai, saying his stand on loss from the 2G spectrum allocation stands vindicated. Sibal had contradicted the CAG report, maintaining there was 'zero loss' to the government as a result of giving 2G licences to new players in 2008. The verdict also echoed in the Lok Sabha where senior Congress leader M Veerappa Moily demanded that Rai quit all posts. Rai heads the Supreme Court-appointed four-member panel of administrators to run the affairs of the BCCI and is also the Chairman of the Banks Board Bureau. Besides Raja and Kanimozhi, the other accused who were given a chit in the main CBI case included former Telecom Secretary Siddharth Behura, Raja's erstwhile private secretary R K Chandolia, Swan Telecom promoters Shahid Usman Balwa and Vinod Goenka, Unitech Ltd MD Sanjay Chandra and three top executives of Reliance Anil Dhirubhai Ambani Group (RADAG) -- Gautam Doshi, Surendra Pipara and Hari Nair, Asif Balwa, Rajiv Aggarwal of Kusegaon Fruits and Vegetables Pvt Ltd, film producer Karim Morani, Sharad Kumar, Director of Kalaignar TV were also acquitted in the money laundering case. Three companies--Swan Telecom, Unitech Wireless(Tamil Nadu) limited and Reliance Telecom limited--listed as accused in the main case were also acquitted. The acquittal of all the accused brought to end the trial that lasted nearly seven years in one of the most controversial corruption cases that involved politicians, bureaucrats and a host of businessmen and corporate executives accused of conspiracy in the allocation of spectrum or radio waves used to offer mobile services. Raja and Kanimozhi were also let off in another case lodged by the ED under the money laundering law arising out of the 2G scam. Saini, whose court came into being on March 14, 2011 for hearing 2G cases exclusively, also acquitted Essar Group promoters Ravi Kant Ruia and Anshuman Ruia and six others in a separate CBI case arising out of the 2G scam probe. Besides Ruias, Loop Telecom Promoters I P Khaitan and Kiran Khaitan and Vikash Saraf, one of the Essar Group Directors, Loop Telecom Ltd, Loop Mobile (India) Ltd and Essar Teleholdings Ltd were also acquitted. 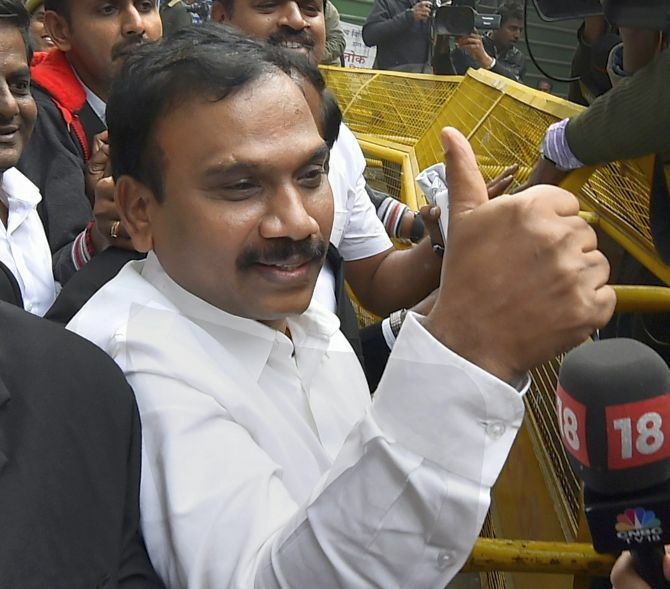 The judgment in the 2G spectrum allocation scam cases brought smiles on the faces of the acquitted accused. Besides the accused and their advocates, Bharatiya Janata Party leader Subramanian Swamy and few journalists managed to get inside the court room. The judge first pronounced the judgment in the cases lodged by the CBI and the ED against Raja and others.